88 mm L/45 Tbts LC/133 х 1 pcs. Initial HE Shell Velocity750 m./s. Initial AP Shell Velocity750 m./s. 500 mm Einzeln2 х 1 / 2 х 2 pcs. 7.92 mm MG 082 х 1 pcs. V-25 — German Tier II destroyer. This ship was designed for escorting the battle fleet and belonged to the most numerous series of destroyers in the German Navy. She boasted a very high speed for her time. Initially ships of this class carried weak artillery, but during World War I many were re-equipped with more powerful guns. As the smallest ship in the game and one of the fastest for her tier, V-25 is arguably one of the best destroyers for her tier. Having a powerful torpedo armament array, decent main batteries, great concealment, and is the fastest ship for her tier, she can easily sneak up to her enemies and annihilate them with ease. 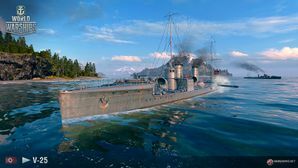 However, this powerful combination of attributes does not reflect the same potential of the later tier destroyers in the line, as noted with Z-52 having only decent torpedo armament and concealment relative to her tier of destroyers. Nonetheless, because of how powerful V-25 is for her tier, she can be considered the best introductory destroyer to new players wishing to play this ship type. Lowest detection of all ships in the game, with a base value of 5.4 km. Very fast and very small, making her hard to hit. Has single torpedo launchers that can almost fire forwards. Can fire torpedoes from beyond detection range. Guns have fastest rate of fire of all Tier II destroyers. Fastest Tier II destroyer (36 knots). Aforementioned forward-firing torpedoes allow V-25 to assault smoke screens with greater ease than other destroyers, given that she can charge in presenting a much smaller target. Weak armor might as well be non-existent. Slowest torpedo reload of all Tier II destroyers. Smallest health pool of all Tier II destroyers. V-25 has quite a number of upgraded modules to choose from. The best one for her to invest in first is likely the torpedo upgrade. Her torpedo arcs are incredibly generous, and provide the majority of her damage output. After that, pick up Hull (B) followed by the improved main battery. The Fire Control System module upgrade that boost her main battery range can be saved for last. V-25 only has one upgrade slot; either Main Armaments Modification 1 ( ) or Magazine Modification 1 are the recommended picks. Low-tier German DDs need skills that allow them to survive longer. Priority Target, Preventative Maintenance, High Alert, Last Stand, Vigilance, Survivability Expert, Concealment Expert, and Advanced Firing Training will all help in this regard. Juliet Charlie ( ), Sierra Mike ( ), India X-Ray ( ), Victor Lima ( ), and November Foxtrot ( ) signals are good signals to mount for this ship. V-25 torpedoes an enemy Weymouth-class cruiser. V-25 destroys an enemy Sampson-class destroyer. A V-25 torpedo breaks the keel of a St. Louis-class cruiser. Many improvements were summarily implemented. In comparison to their predecessors, the V-25-class was larger in every dimension to increase overall displacement, and ergo increase internal volume and functionality. As well, the vessels moved to using purely oil-firing boilers, instead of the more common coal or mix-firing boilers of the time. Despite the greater operating costs, the intended effects were achieved. The class of vessels were able to achieve better cruising capabilities and in general attain better seaworthiness. The transition to oil-firing machinery resulted in higher speeds. In fact, despite the design specifications rating the propulsion to achieve no more than 33 knots, almost every ship was able to exceed that parameter in sea trials; the fastest ships surpassed the benchmark by almost 3 knots. Furthermore, since the oil-firing equipment was smaller than conventional coal and mix-firing equipment, less manpower had to be dedicated to their daily operations, and the space saved could be allotted for more fuel. Hence, the V-25-class achieved greater operation range than that of their predecessors as well. The class was able to incorporate some of the latest torpedo boat-level weaponry that was in the Kaiserliche Marine arsenal. The class all mounted three of the latest 88mm SK L/45 rifled guns in single mounts; forward, center, and aft, respectively. To increase their potency, most of the coats in the class later had their guns replaced with the much more powerful 105mm SK L/45 guns. Furthermore, the class carried six torpedo tubes with eight of the latest 500mm torpedoes. It is interesting to note that the Kaiserliche Marine still kept experimenting with and implementing forward facing torpedo tubes, which later would become a staple of torpedo boat construction. SMS V-25 also briefly carried a Friedrichshafen FF.33 seaplane in place of her middle gun. Over the span of three years, three shipyards would construct 71 Type 1913 Hochseetorpedoboote across Imperial Germany. As per the serializing procedure of the Kaiserliche Marine, the ships were numbered according to the yard that built them. For example, SMS V-25 was the 25th torpedo boat built by AG Vulcan Stettin. These 71 torpedo boats would go onto serving in the High Seas Fleet during World War I. 62 would be lost over the course of the War: 32 sunk during combat in the North and Baltic Seas, 30 would be scuttled with the German fleet in Scapa Flow. The remaining 6 were given off as war reparations to Britain, France, and Italy. The V-25s only served with the Imperial German Navy, yet it flies the Kriegsmarine ensign of Nazi Germany. The flag itself did not exist until the 1930s. This page was last modified on 17 September 2018, at 18:35.